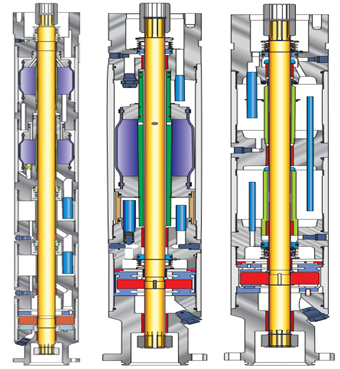 Mechanical Seals: prevent the well fluid from traveling down along the shaft, and into the next chamber. It is for this very reason the mechanical seal is often called the heart of the seal section. Thrust Bearing: carries the thrust load of the pump shaft and stages (fixed impeller type only). The biggest enemies of the thrust bearing are excessive thrust, vibration, misalignment and foreign material or fluids (water). Labyrinth type seal uses the difference in specific gravity of the well fluid and the motor oil to keep them apart even though they are in direct contact. Labyrinth-style protector creates a tortuous path of protection from well ﬂuids. The protector oil specific gravity is around 0,85. As long as well bore SG is heavier, labyrinth path work to isolate motor fluid from well bore. Excessive cycling / frequent start-ups: well and motor fluids are in direct contact. Each time the motor is stopped its oil cools, contracts, and a small amount of mixing occurs. If there are many start-ups (e.g. intermittent producers) well fluids can eventually reach the motor, especially in deviated wells. Bag type seal is designed to physically separate the well fluid and motor oil by the mean of elastomeric bags that function as a positive barrier. By definition, an elastomer is a rubber-like material which can stretch under low stress and return to its original shape when the stress is removed. Elastomer bag creates a positive barrier to well bore. Bag expands and contracts to meet motor demand. As shown by the Figure below, there is a check valve which opens at 3-5 psi to release pressures inside the bag. Elastomer must be selected carefully to match well temperature and fluid properties. Unlike Labyrinth type seal, bag type can be installed at any well deviation (even in horizontal wells). It offers a great deal of flexibility and is useful in a wide variety of applications. One area where care needs to be taken with this type of seal is with harsh well chemicals, as seal failure may be experienced (a bullheading acidizing job for example). The durability of the bag material depends on the temperature and the environment to which it is subjected. The following video shows an excessive bag wear due to acid (results of the Dismantle Inspection and Failure Analysis). In the same video, a brand new bag is presented, so you can note the difference! NB: It is common practice to run tandem or dual seal sections and the configuration can be labyrinth-labyrinth, labyrinth-bag, bag-labyrinth, or bag-bag. 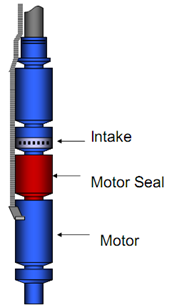 The more seal sections the more mechanical seals, which increases shaft isolation. Furthermore, The expansion volume in large motors may exceed that of the top chamber of a seal section. 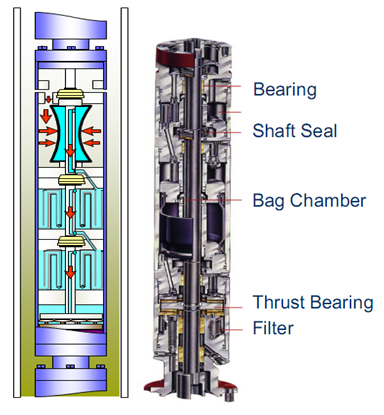 Therefore, seal sections with the top two chambers having expansion bags in parallel are used to provide the necessary volume. NB: The seal sections are filled with the same oil used in the motors. NB: The seal requires a small amount of horsepower. Generally, the horsepower requirements are small enough to be neglected when sizing the motor to a pumping application. Tagged artificial lift, axial flow, Bag, Bag type protector, baker hughes, BOI, bolt on intake, compression pump, dynamic gas separator, electrical submersible pump, energy, Equalizer, floater pump, Gas handling device, gas separator, General Electric, impeller types, Integral, ISO standards, Labyrinth, Labyrinth type protector, mixed flow, Mixed flow impeller, motor protector, oil and gas, Petroleum engineering, production engineer, production optimization, production surveillance, production technologist, Protector, pump, pump shimming, radial flow, radial impeller, Reverse Flow, schlumberger, Seal Section, Standard Intakes, Static Gas Separators, thrust bearing, vortex. Bookmark the permalink.